We have soaked up the last few moments of Halloween, and the children enjoyed coming to school in their costumes to share or their favorite dress up from home. I loved watching the children move about the classroom with their costumes! 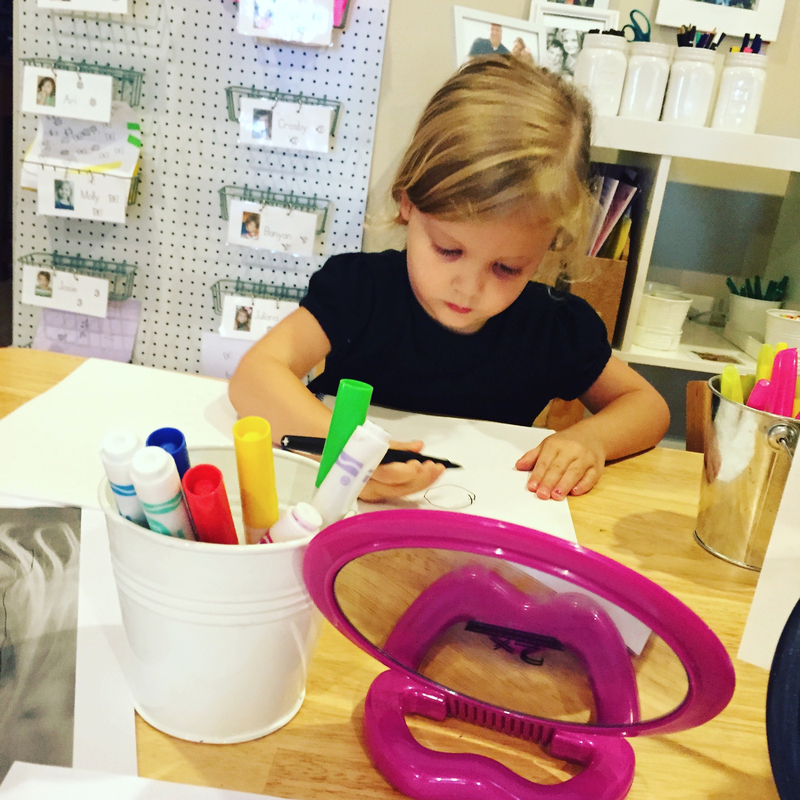 Our learning trays are changed once a month, or sometimes a bit more frequently. There are 12 trays for the children to choose from in the classroom. 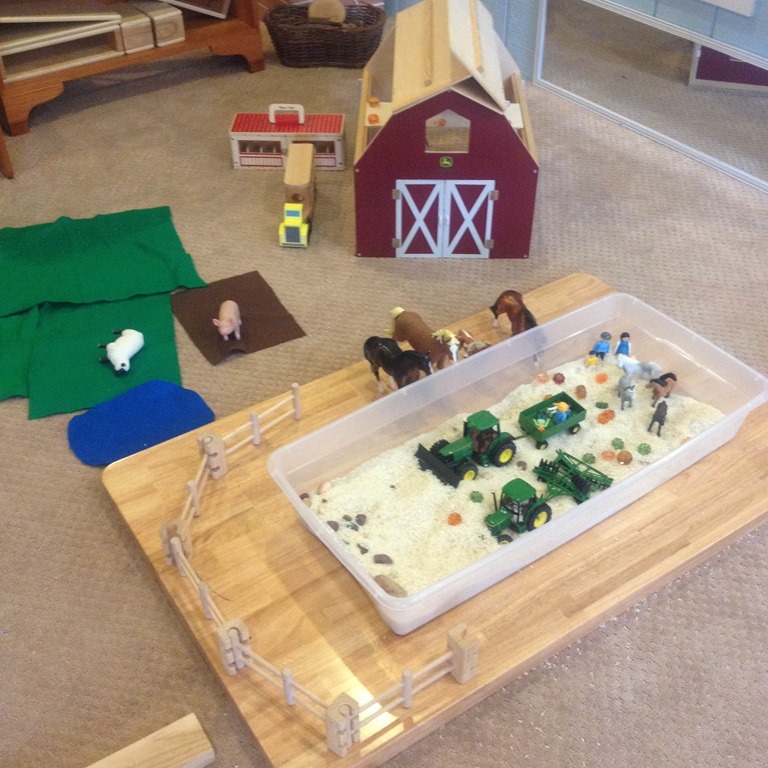 I try to have the trays focus on math, literacy, fine motor, pouring/scooping, or sensory play. B had no trouble sorting pumpkins into the correct category of “Big, Medium, and Small” in his Transformer Bumblebee costume! 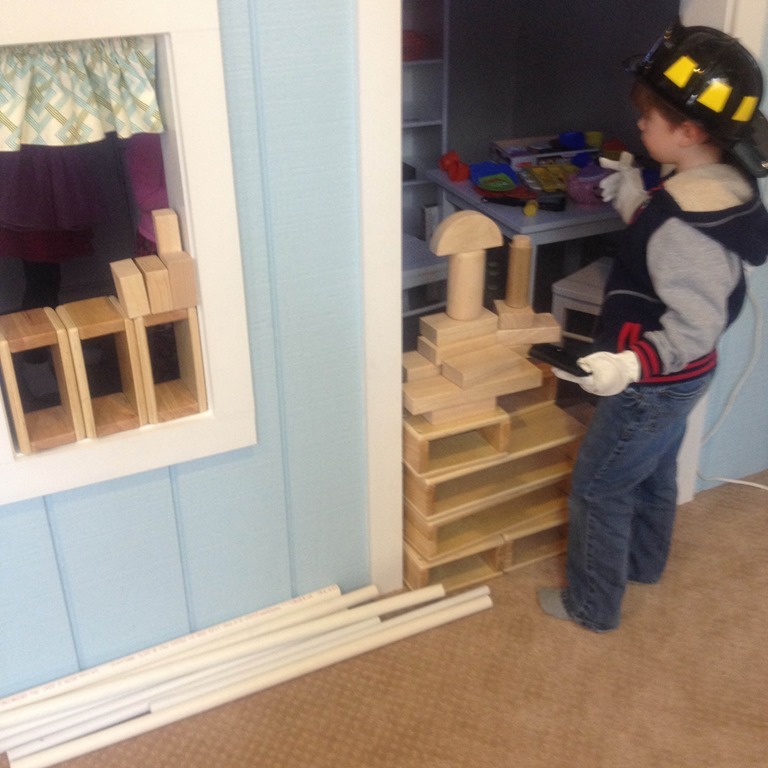 H was also able to get a bunch of sorting accomplished while donning his fireman get-up! Fairies and Princesses also did a great job with the new sorting circles! 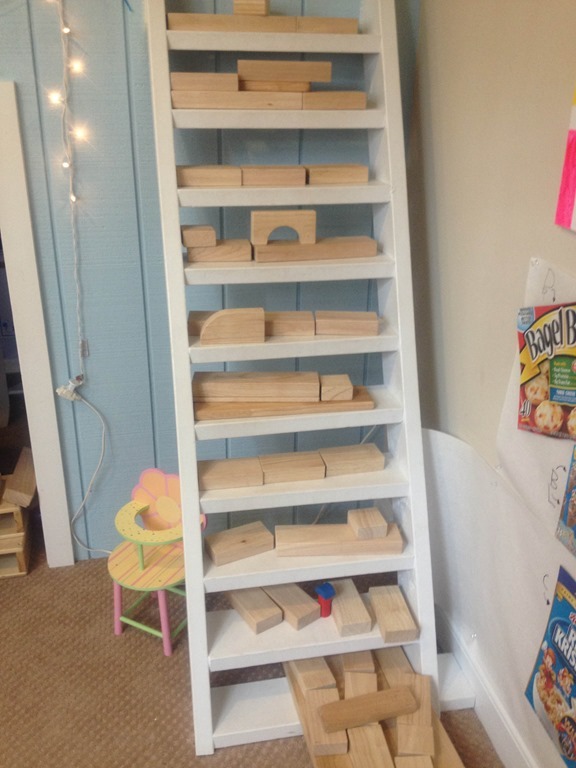 Below is a picture of a fine motor tray. There is a thick sensory material called “floam” lining the bottom of the tray, and then pumpkin toothpicks. The children have to use their pincher grip to get the toothpicks into and out of the floam. 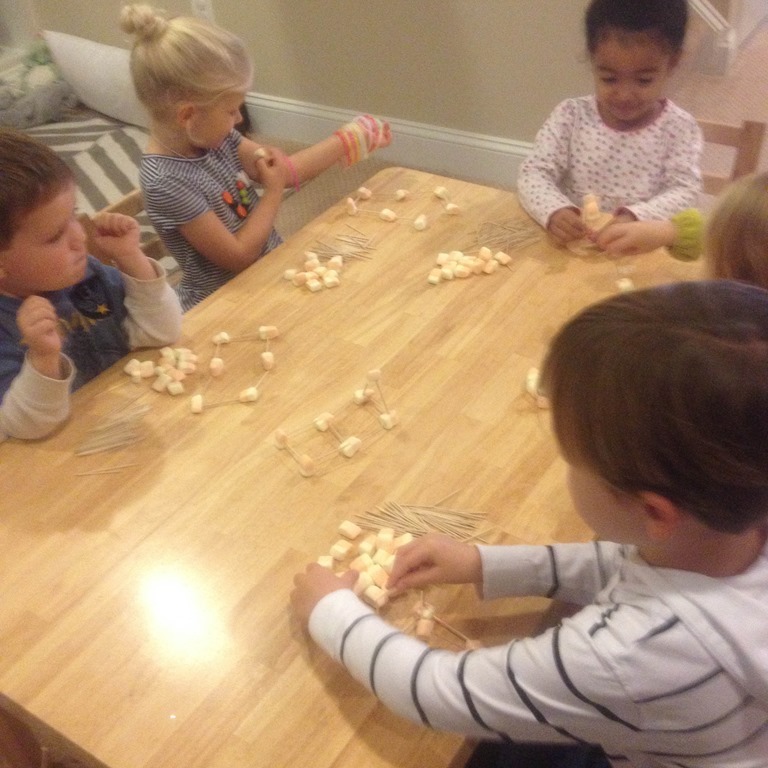 Then they all sat together and worked on pushing the pumpkin toothpicks into the thick container of green foam. This is great fine motor and pinching work. 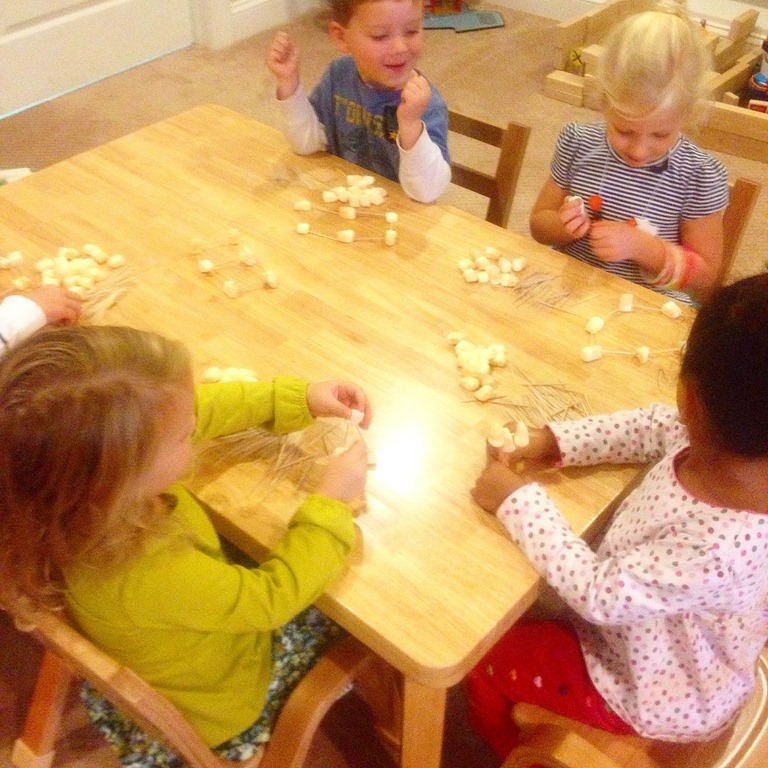 A new table invitation this week was a squirrel counting game. I used the acorns we collected a few weeks ago as the manipulatives. The children had to roll the dice and then feed an acorn to each squirrel until all of the squirrels got some food. They played this again and again throughout the week this week! 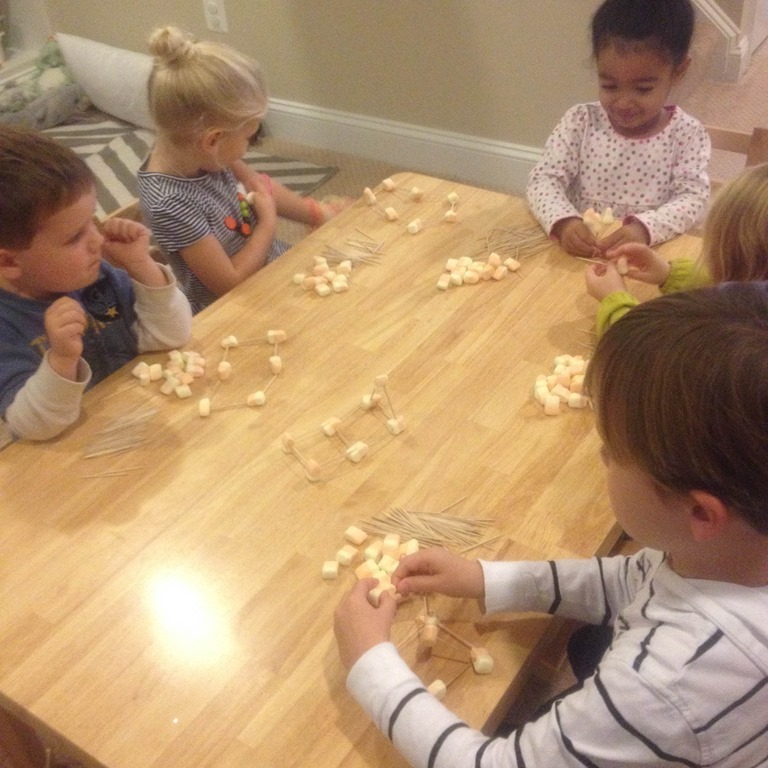 Below is another whole group counting lesson we did that went along with the Halloween fun! I made a large poster with pumpkins, and numbers inside of the pumpkins. They used mini Halloween manipulatives to put the correct number of manipulatives inside of each pumpkin shape. This is a picture of our pumpkin investigation that we worked on together as a class over the course of a few weeks. This investigation incorporated Math and Science goals throughout the lessons. The class looked closely at our “classroom” pumpkin and gave me describing words to tell what the pumpkin looks like, how it feels, and information they may have already known about pumpkins in general. Then we “guessed” how many lines were on our classroom pumpkin. This was the first time we had discussed estimation and guessing as a math skill. Many children weren’t sure how to even give a best guess…for example many people chose numbers that were very small even though we could see lots of lines on the pumpkin. 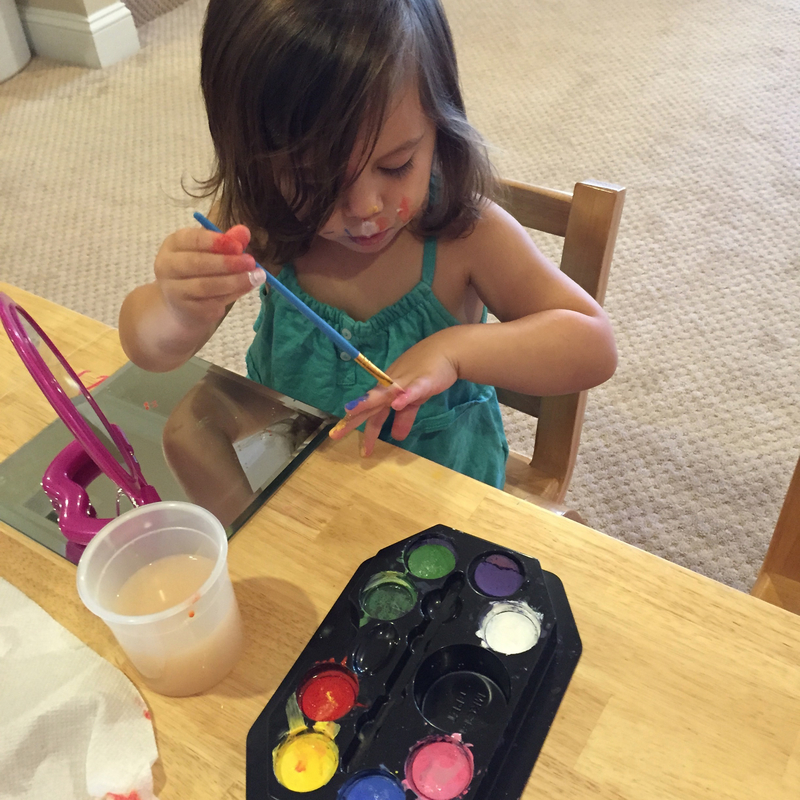 This is an advanced thinking skill, and you can practice it at home with your child. “How many steps do you think it will take to get to the car?” Give some guesses and then test out your answer. Try to pick examples with smaller numbers when you are just starting. If your answer is in the 100s or even over 50 it is going to frustrate them. Then as they gain confidence you can increase the estimation amount. 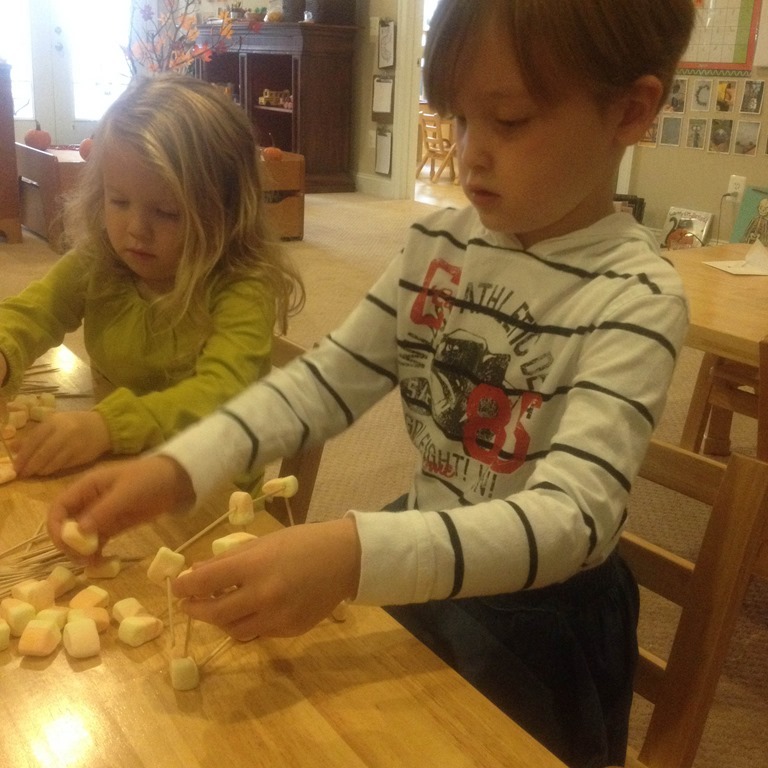 We used this same strategy to figure out “How Tall is our pumpkin?” and then we measured it with uni-fix cubes. As well as “How wide is our pumpkin” and we cut pieces of yarn to wrap around the pumpkins circumference. Often times I will cover concepts well above their comfort zone, or talk about things that are brand new to them. But, hopefully over time and repeating the lesson in new ways these concepts will solidify. Lastly, we took our pumpkin outside and hammered it with golf tees! I set up a pumpkin washing station outside complete with mini pumpkins, gourds, brushes, and lots of bubbles. I also dyed a batch of spaghetti noodles in lots of different shades to play with on the light table….gooey, spooky, and oh so fun! That might be one of my favorite pictures from the week! Thank you to A’s mom for visiting us on Monday! 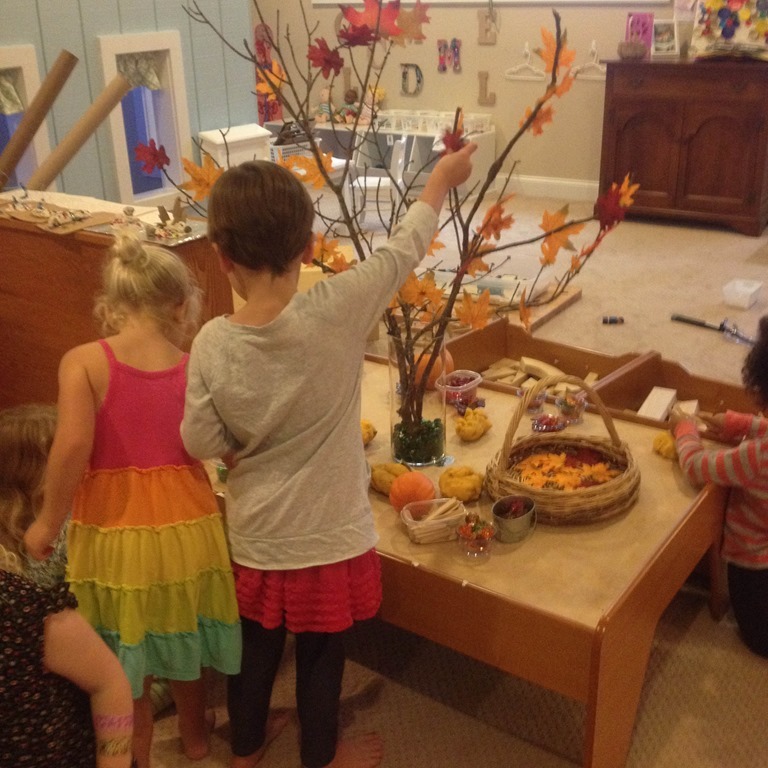 Categories: early childhood education, holidays, reggio emilia inspired, Uncategorized | Tags: counting, estimation, fall, fall sensory bins, fall themed units, fall themes, learning trays, number sense, play matters, preschool at home, preschool math, preschool science, pumpkins, reggio emilia, reggio emilia inspired, reggio inspired, sensory play | Permalink. 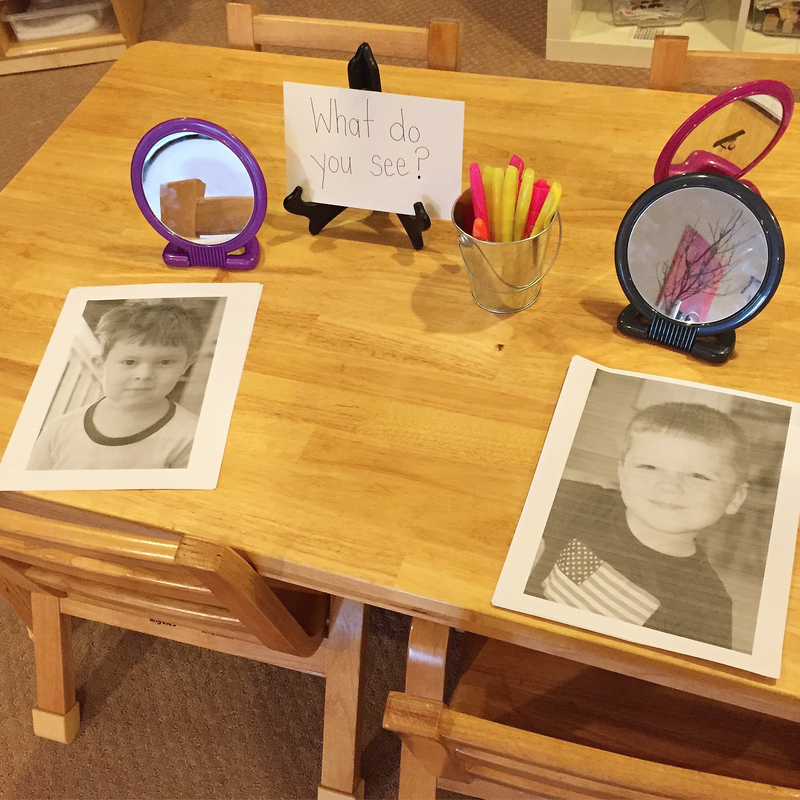 To get to know each other better I have been slowly introducing different provocations that allow the children to look more closely at themselves and their features. We have read different books about being ourselves such as “Stand Tall Molly Lou Melon” and “Leo the Late Bloomer.” The overarching theme in these books are that we are all different and we should be kind and appreciate these differences. 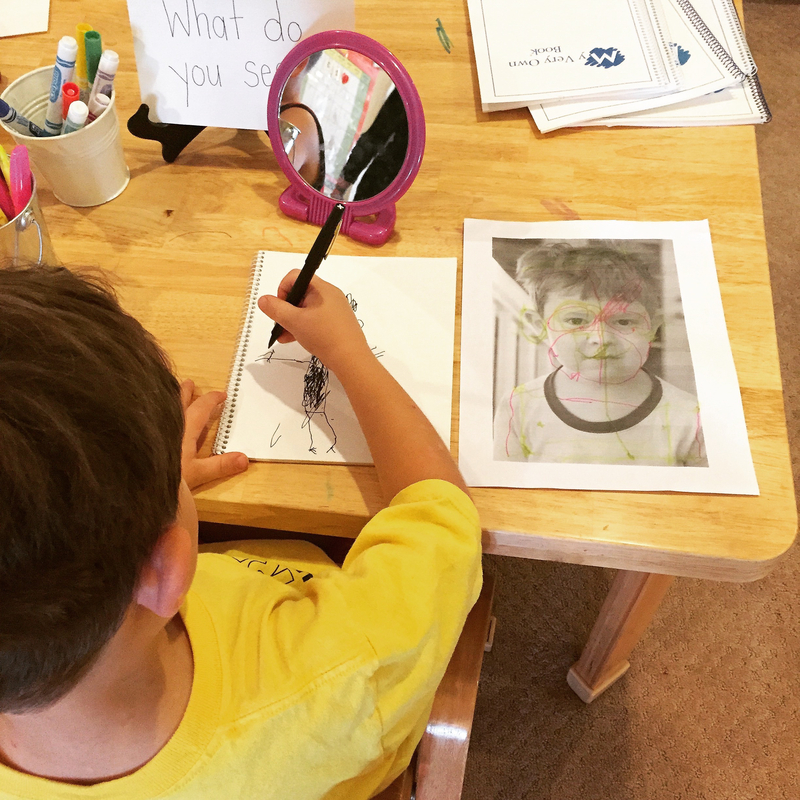 After they had a chance to draw on their photos over a series of days, I then asked each child to draw a black and white photo of themselves in their learning journal. The results were often very detailed on the heals of studying their photos. 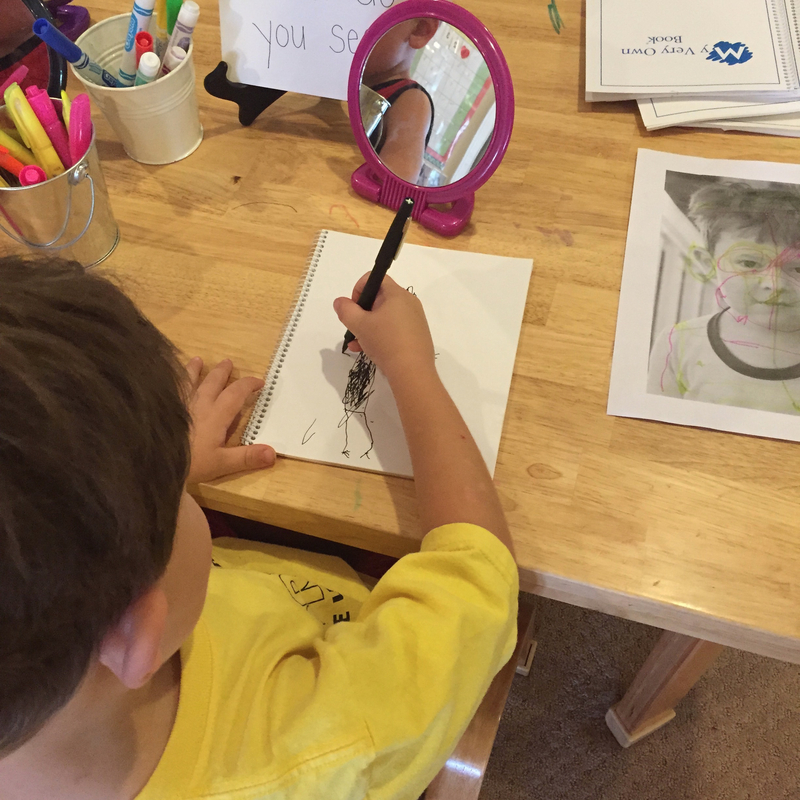 Here is H working through his picture of himself while referencing his black and white photo and the mirrors. drawings become more complex, although usually unrealistic. drawings of people are very simple with few features. Objects in drawings often float in space and are not anchored. “Tadpole Figure People” are drawn with a very large head on a small body with extended arms. 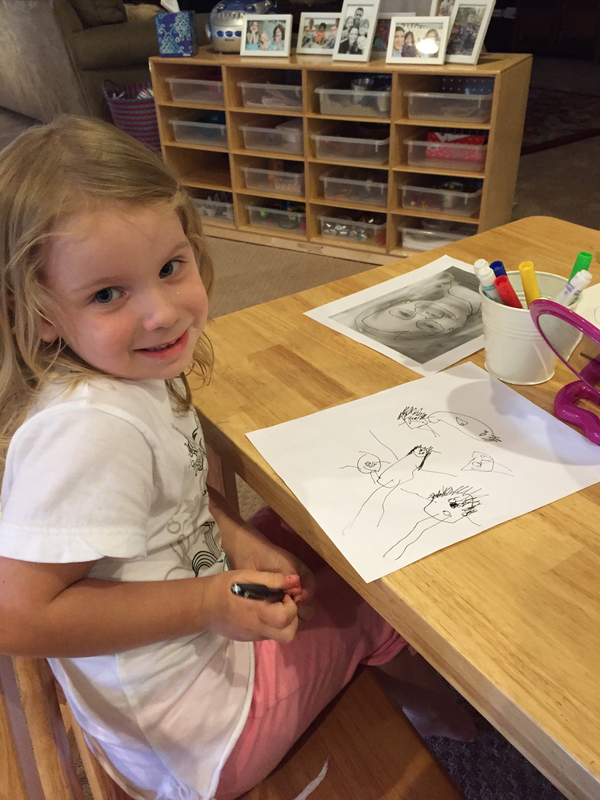 So these activities are hoping to get each child to look a bit deeper and draw a more detailed picture of themselves. Above M is focusing very hard on her self portrait. She actually went on to draw many of the people in her family too. The graphic above shows the stages of holding the pen. Your child might still be at the first stage of pencil holding, but we will be taking steps this year to move them closer to a correct pencil grip. The Handwriting Without Tears Program has some great songs, games, and techniques to encourage this! 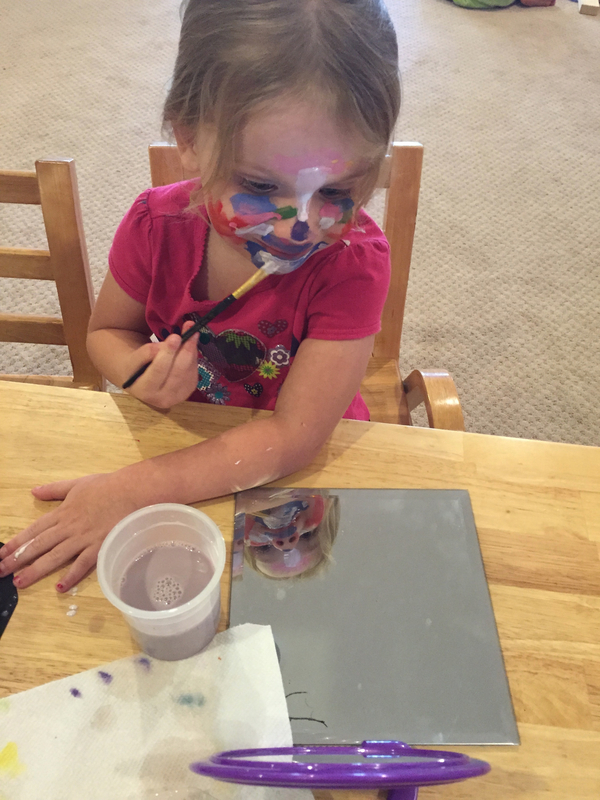 This week I set up a face painting station at the tables, with a twist! 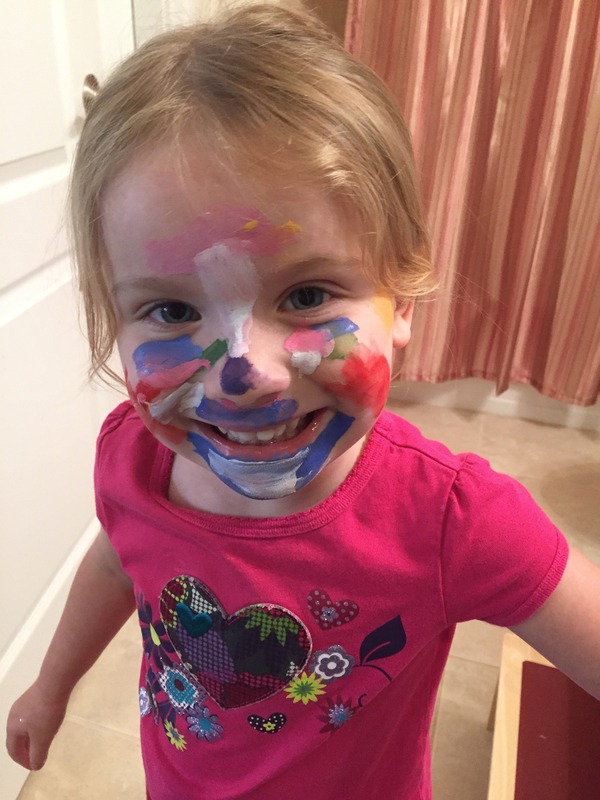 Instead of having me paint their face, THEY got to paint their own faces. Mrs. Brittany and I sat near the table on and off in the morning to take pictures and more importantly talk to the children. We would ask them, “What are you painting now?” “What color are you using to paint your cheek?” We were trying to draw attention to their painting and the details of their faces. 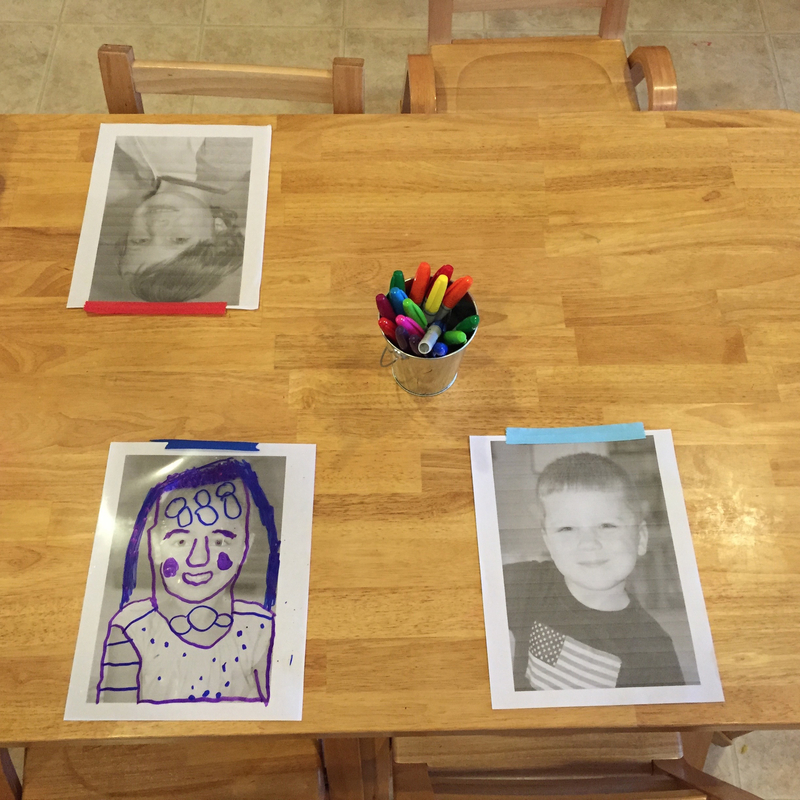 My goal is for this activity to again translate to their pictures of themselves. A even went on to paint her hands and fingers. It was great to see her painting other body parts, and hopefully she will include them in future pictures! 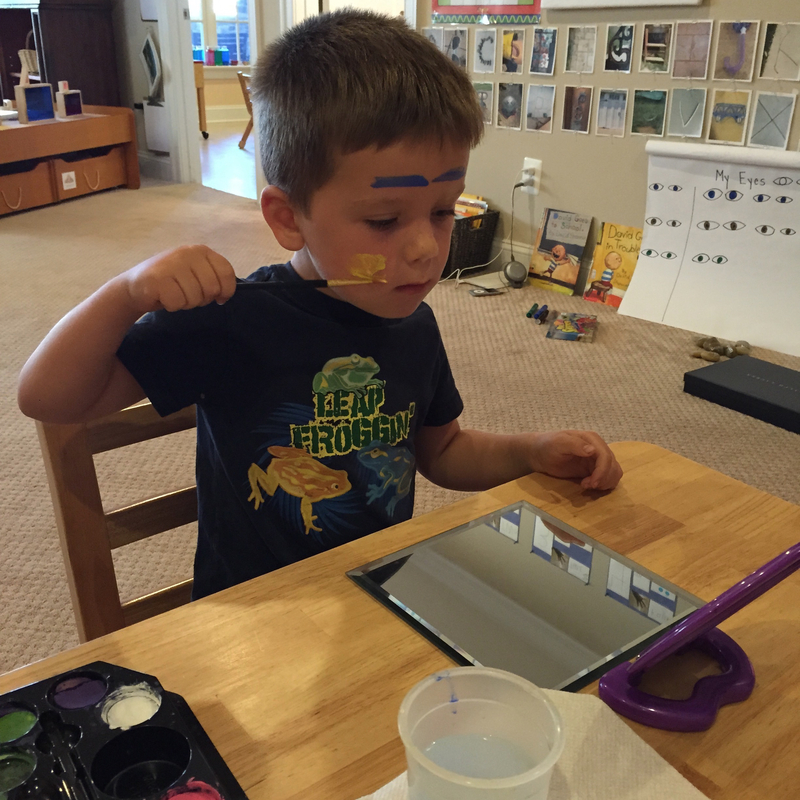 D got in on the face painting both mornings this week! 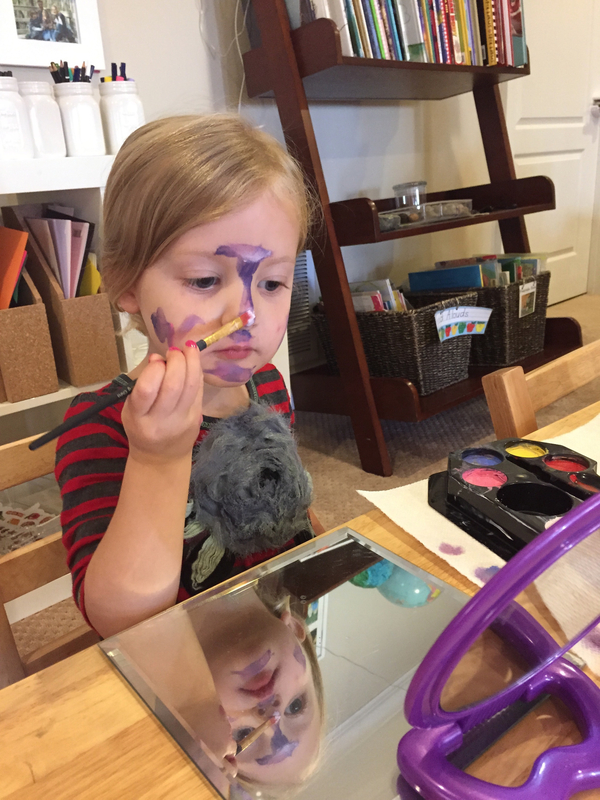 M was very careful and painted lots of purple on the main portions of her face. 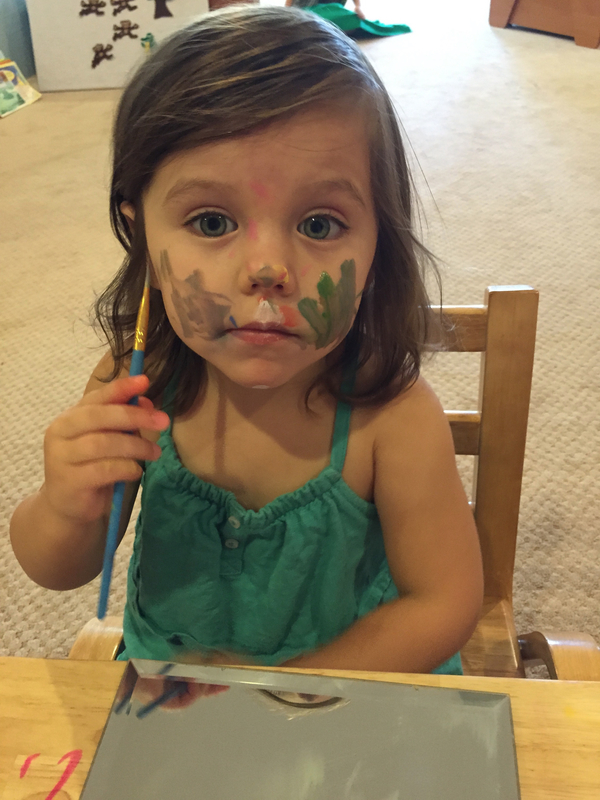 D was very interested in the face painting activity. It was the first choice she visited this morning. And the results were wonderful! 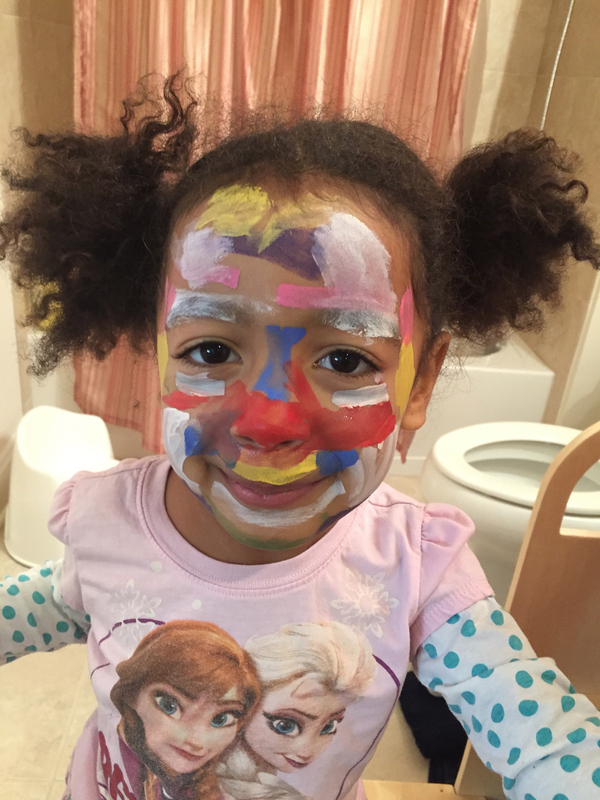 I felt that another aspect of this activity that was an unexpected outcome was how confident the children felt in their painted faces. Some children started to say that they felt “weird” in the face paint. Mrs. Brittany and I emphasized they had done such a remarkable job with their paintings and it reminded us that we are all different and perfect just the way we are…similar to the themes of the books we have been reading in class! 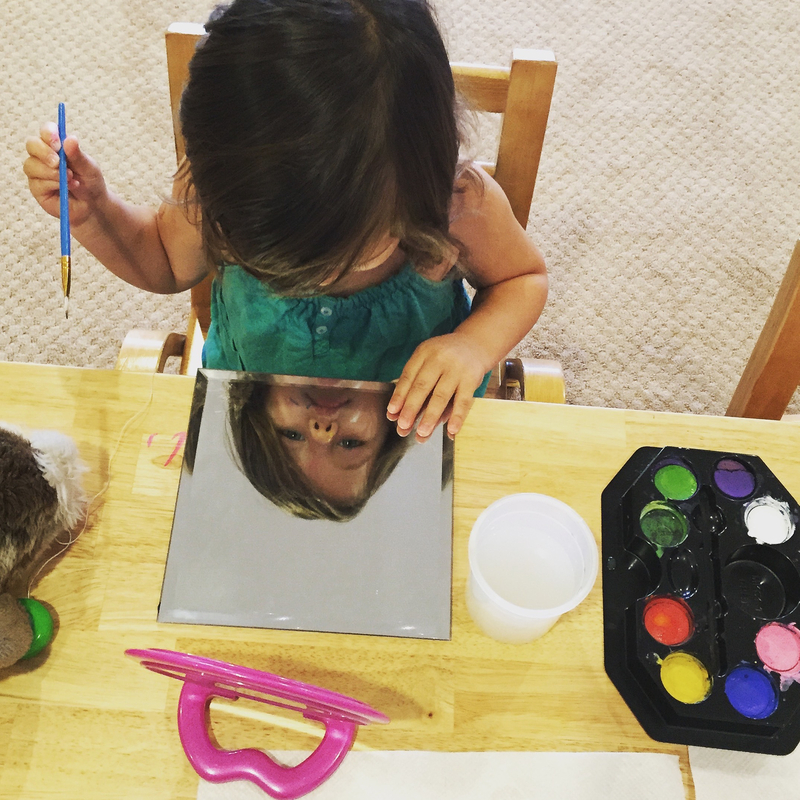 Lastly, we are still working on an abstract art self portrait! I can’t wait to share the finished results next week! 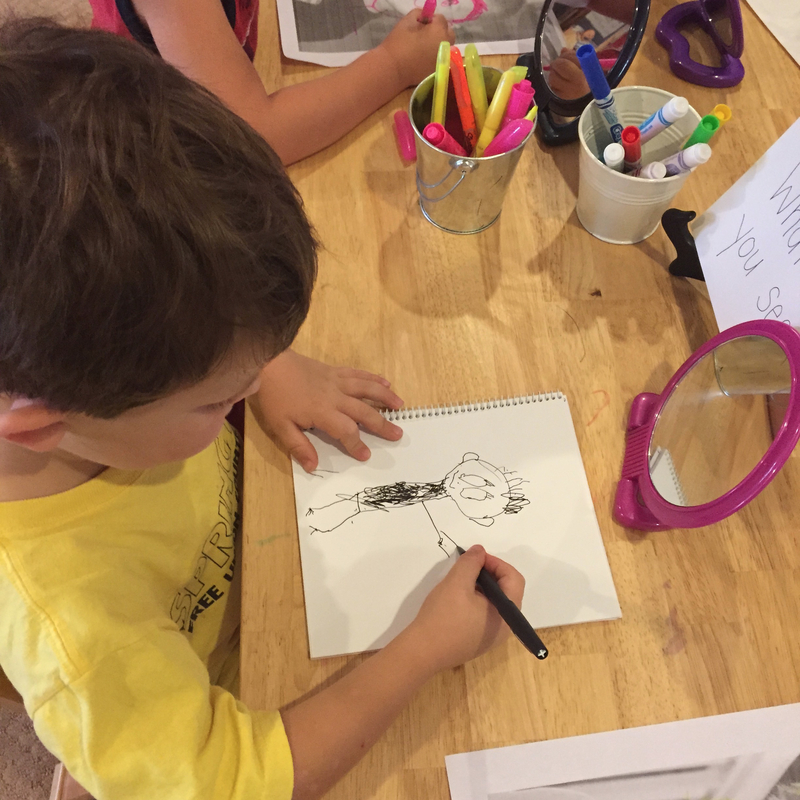 Categories: Uncategorized | Tags: developmental drawing, process art, provocations, reggio emilia inspired, self portraits, selfawareness | Permalink. 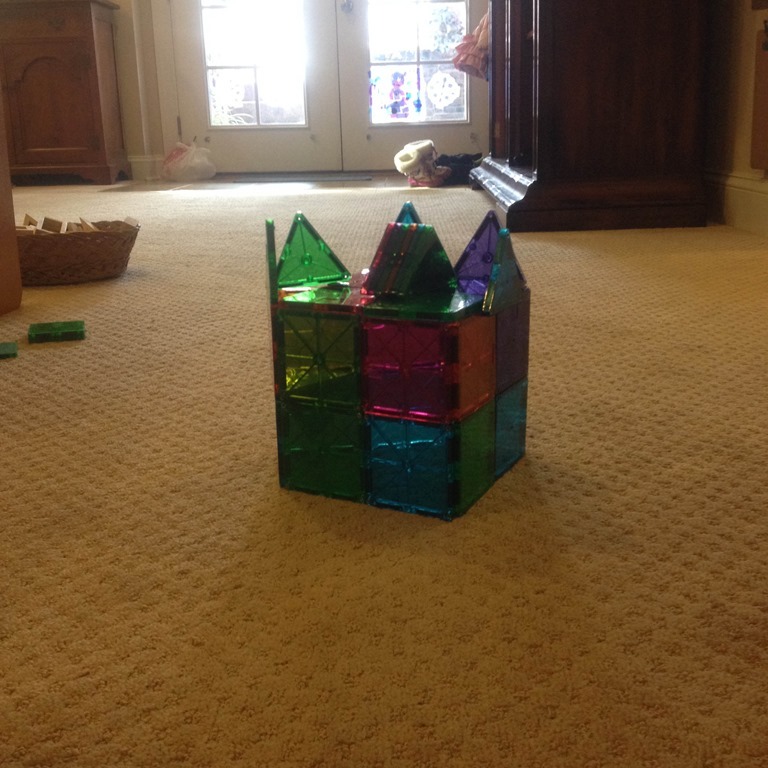 Our love of Magnatiles is just never ending! 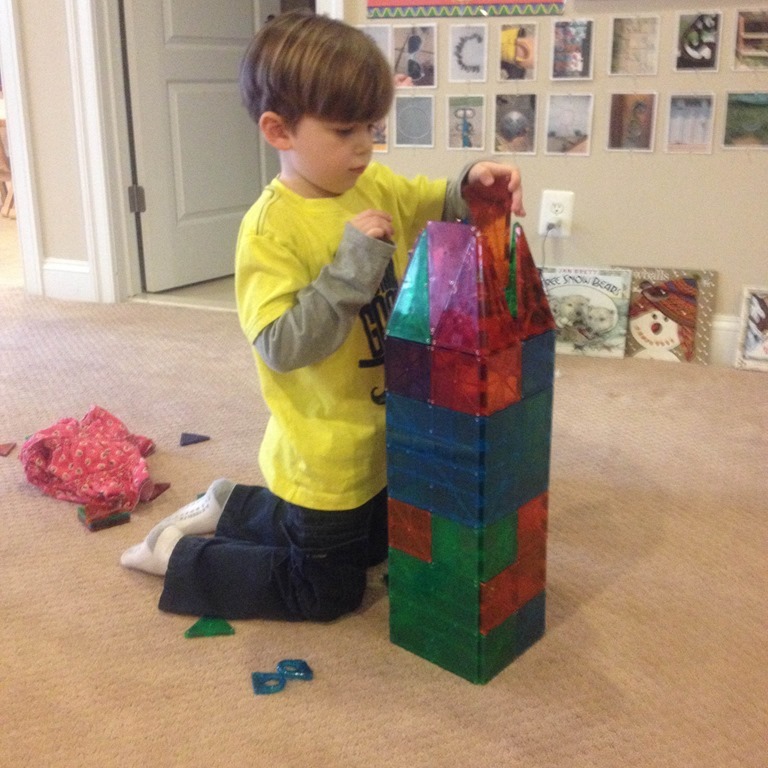 The children have built with them flat on the ground, and are now experimenting more and more with taller structures. 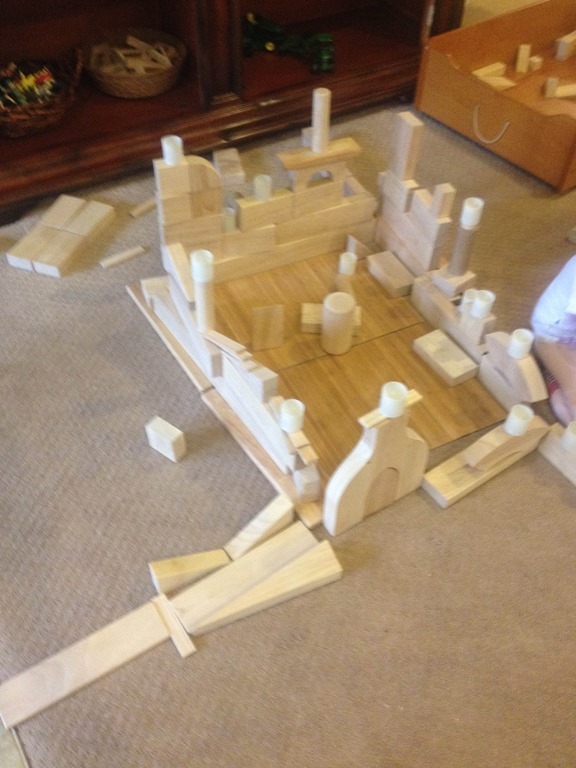 These photos were taken one morning when they were all working together on a number of different buildings in the classroom. They were actually locking up our large collection of lalaloopsy dolls inside of the Magnatiles. I love the variety of buildings they created. 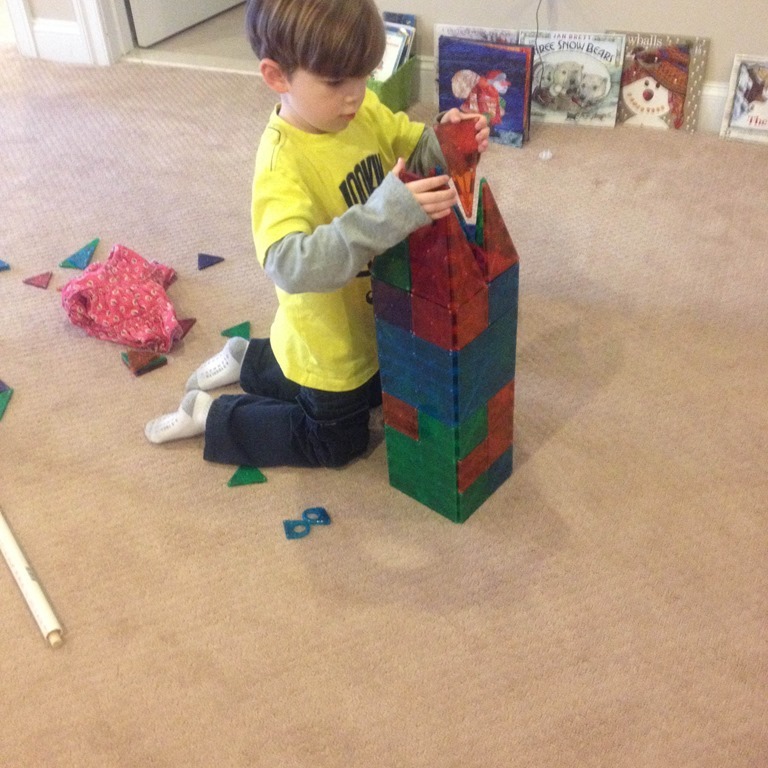 Such concentration by L to put on his last piece! We have been having fun with more loose parts in the classroom too! I pulled out a new set of Duplos that make cupcakes, ice cream cones, and cakes. 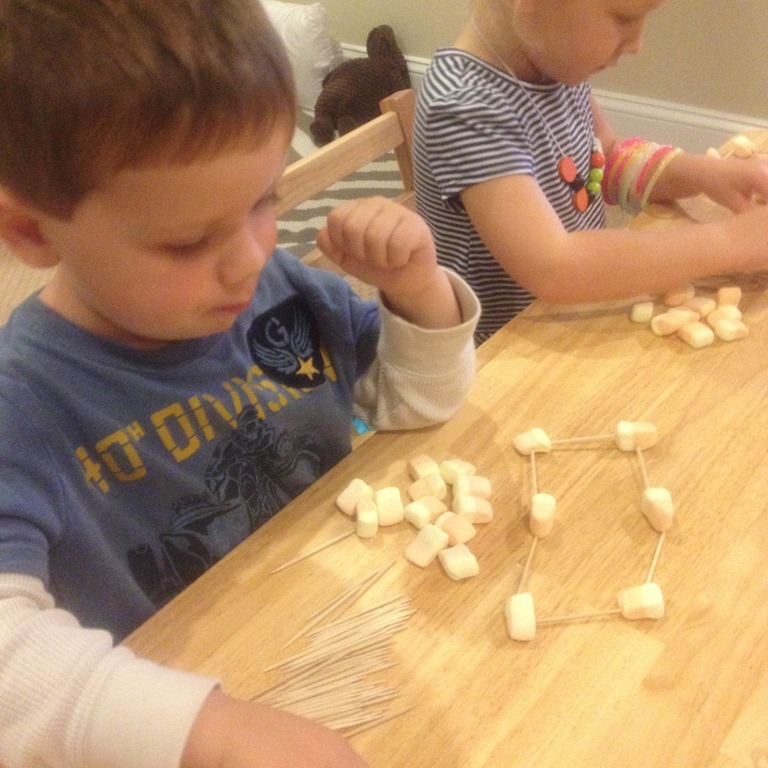 They went right to work making lots of sweets with the Duplos. 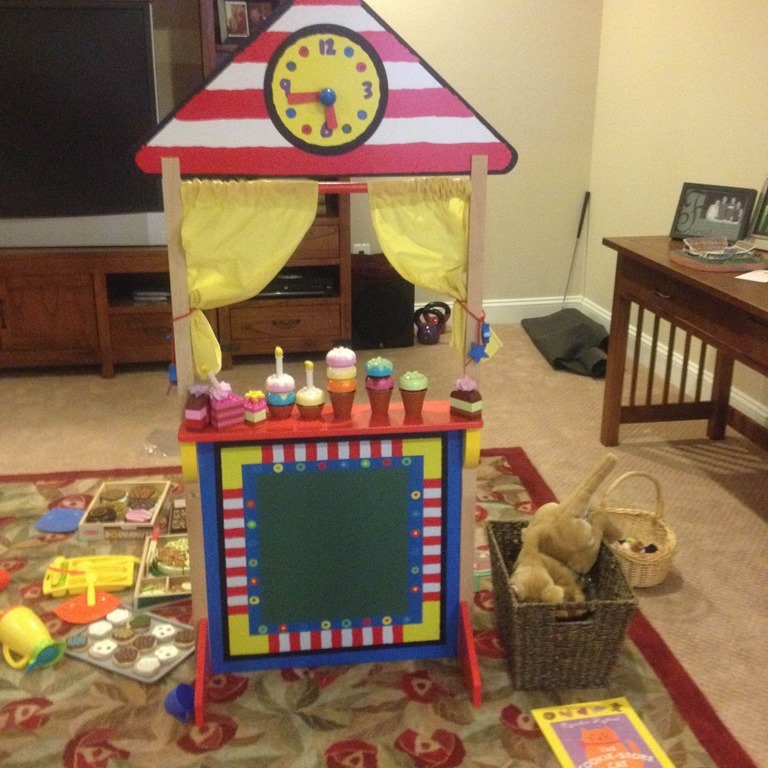 I was surprised when the moved the Duplos over to our puppet theatre, and set up their own bakery. 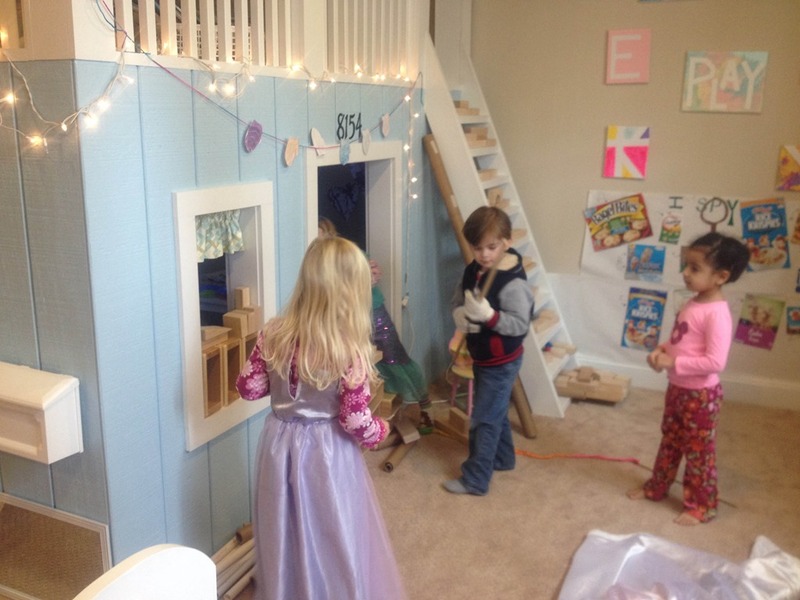 I love when the move the materials around the classroom to create new play spaces. 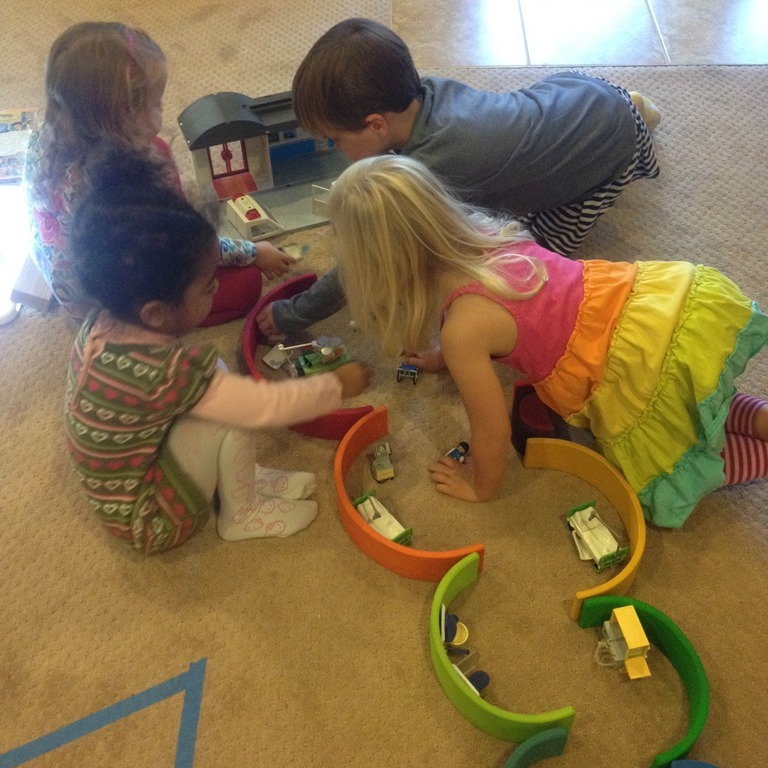 The train table was recently filled with some new toys and loose parts. 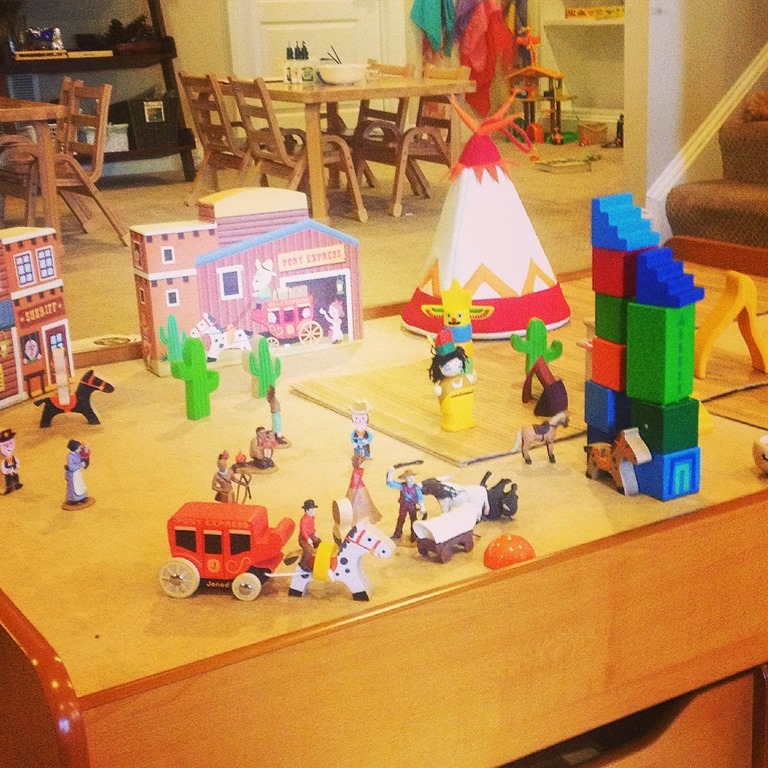 We got a new box of Janod Wild West wooden pieces, a Magic Cabin teepee set filled with Native Americans, and colorful blocks. These new loose parts created a lot questions about cowboys and Indians and their tools, history, and how they lived. 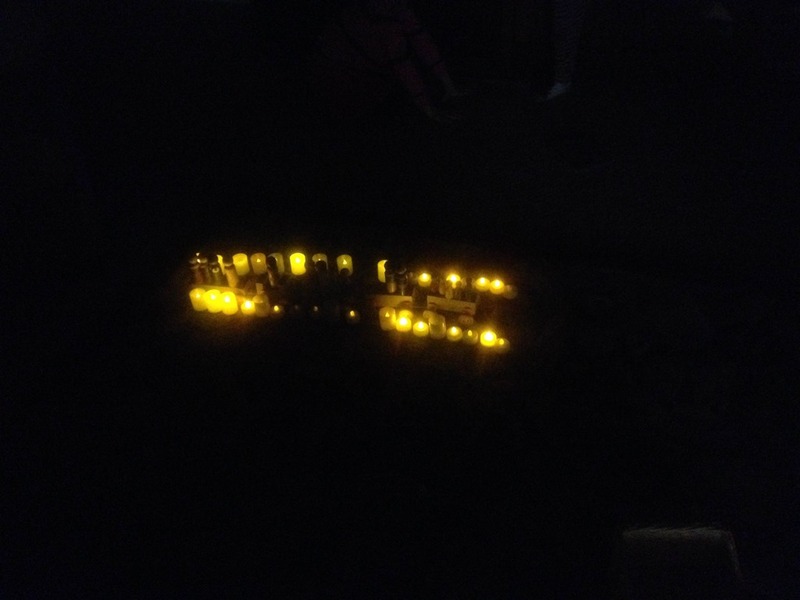 This isn’t a great picture, but one of the loose parts that the children are drawn to again and again are our mini battery powered tea lights. This is a little runway strip they made in the family room with the tea lights, blocks, and peg people. 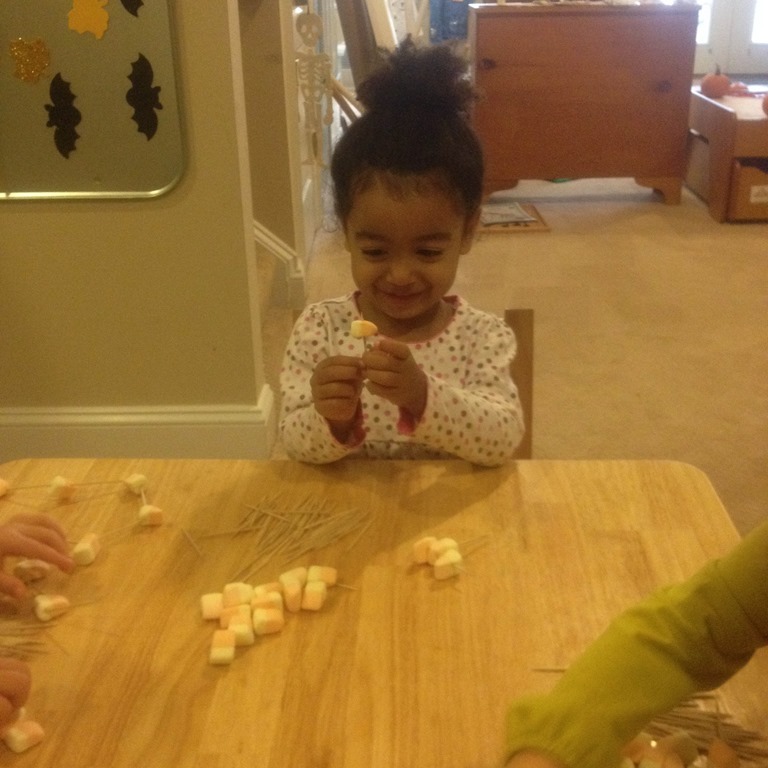 These last series of pictures were from a recent pretend play activity with our unit and hollow blocks. 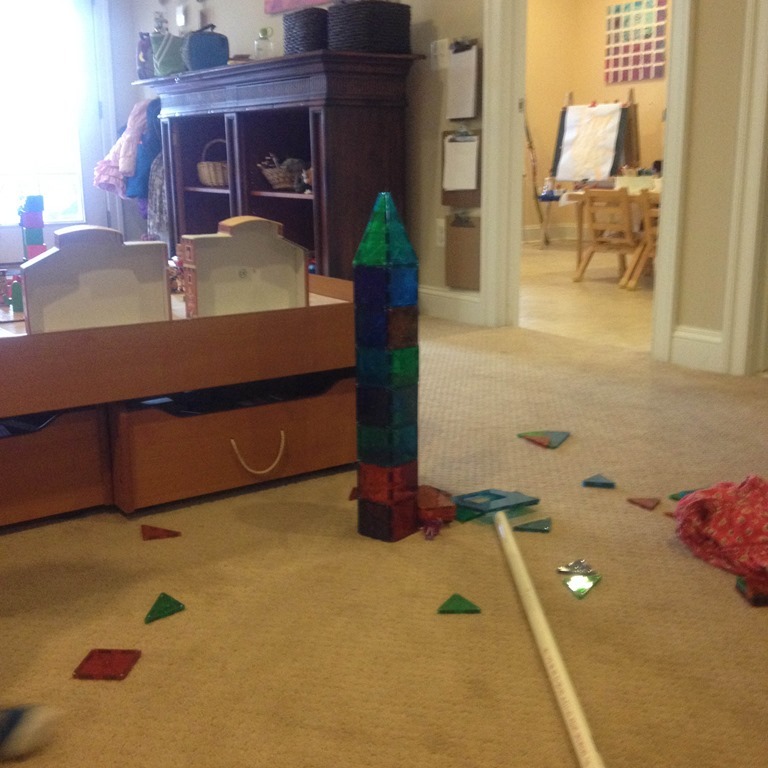 They were pretending that a tornado was coming to Crozet PlaySchool, and all of the blocks were protecting the house. L was apparently calling for help and protecting the house at the same time! They even wanted to protect the ladder going up the stairs! I love seeing them utilizing all of the loose parts in the classroom. They are always full of ideas of how they are going to use the materials in the classroom, and I can’t wait to see what they think of next! 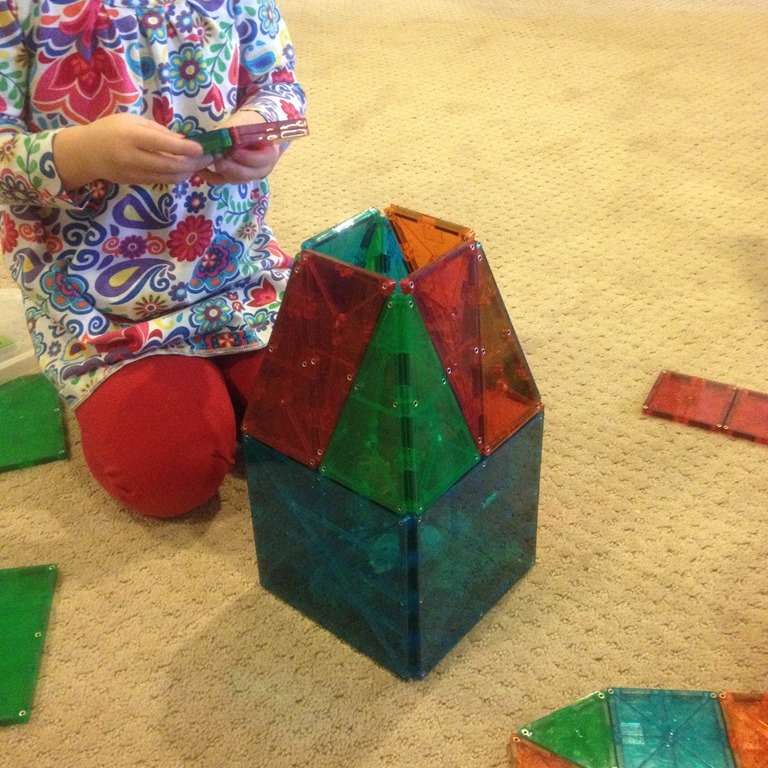 Categories: reggio emilia inspired | Tags: loose parts, loose parts play, play based preschool, reggio emilia, reggio emilia inspired | Permalink. Loose parts can be used anyway children choose. 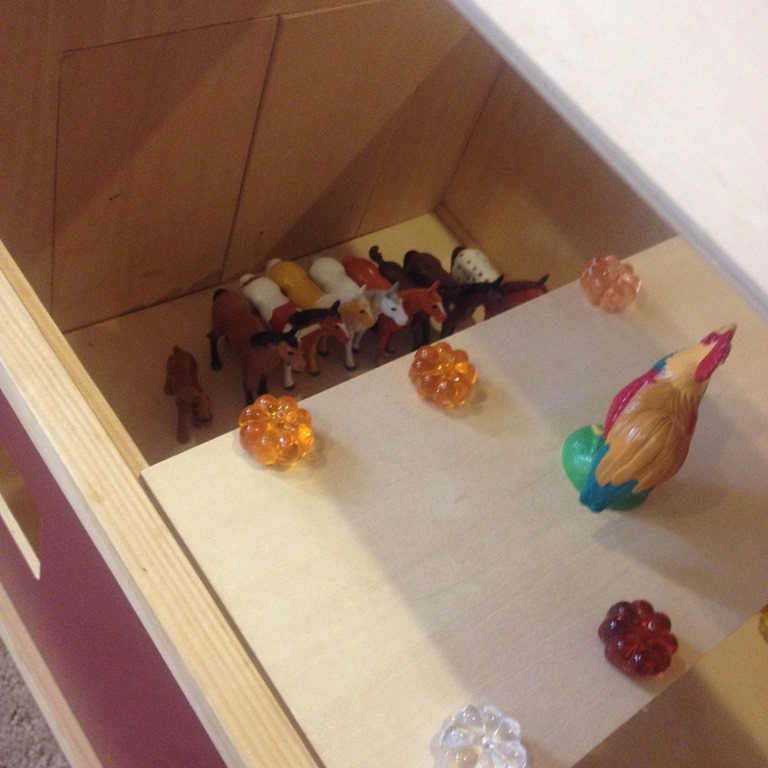 Loose parts can be adapted and manipulated in many ways. 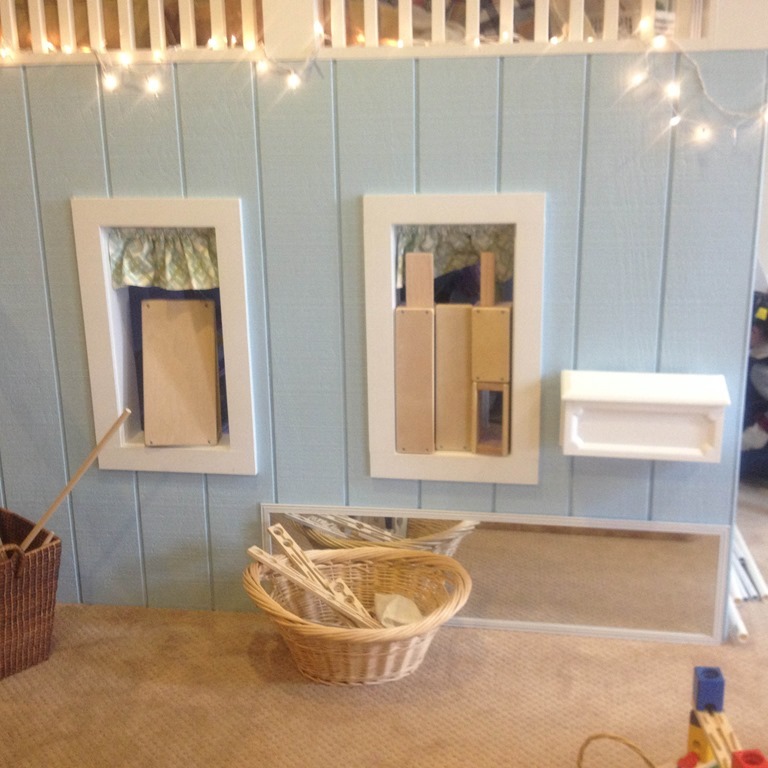 Loose parts encourage creativity and imagination. Loose parts encourage open ended learning. 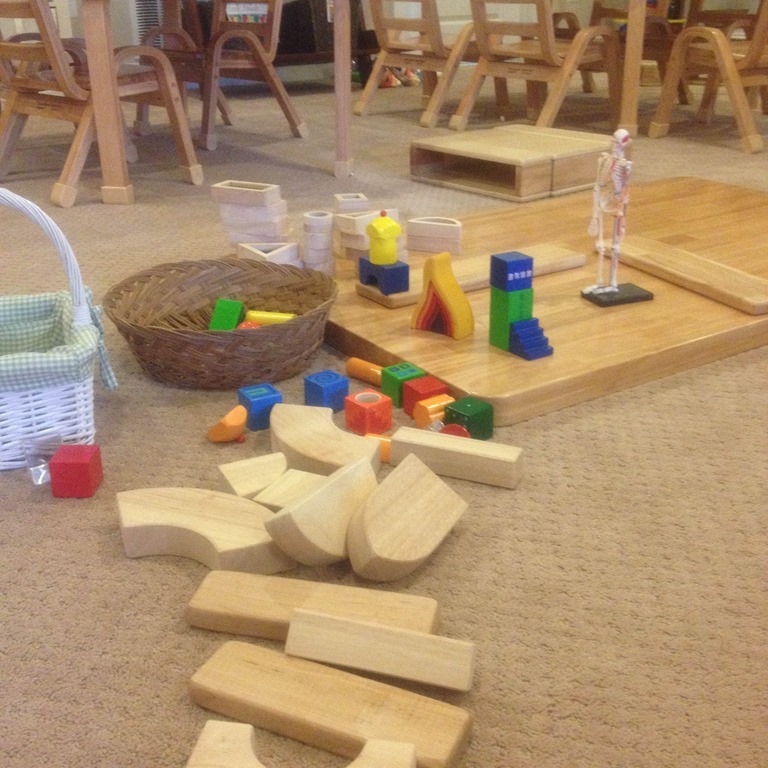 Children choose loose parts over fancy toys. All of the reasons for loose part play can be found in these pictures I have compiled from the past few months. 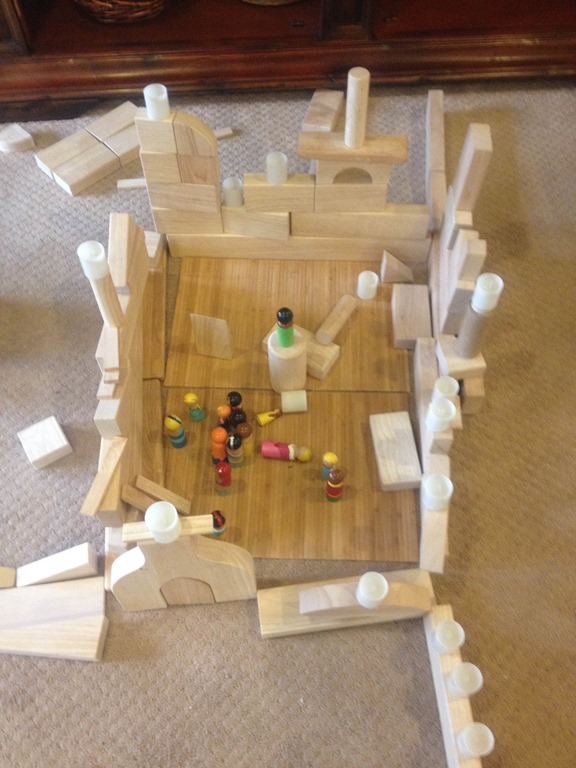 The bottoms of the castles are placemats from World Market, unit blocks, peg people, and led candles. 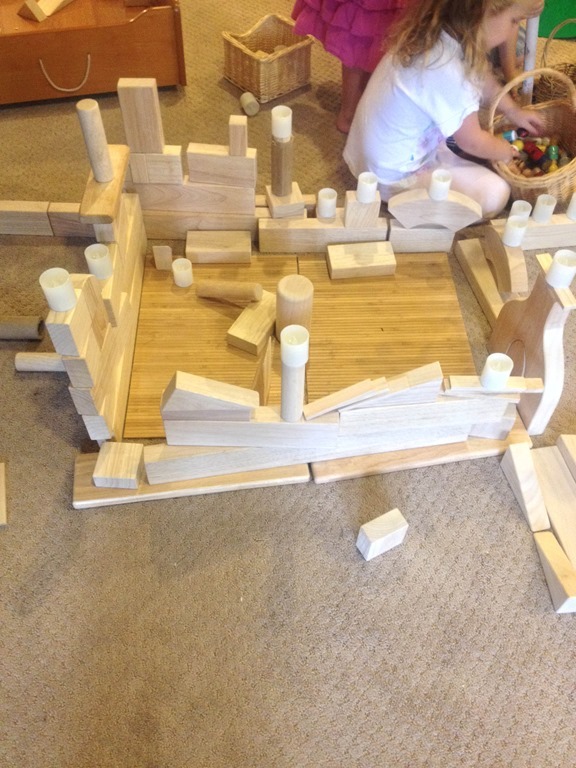 The beauty of loose parts is they can be combined, moved, stacked, dragged, and transformed. 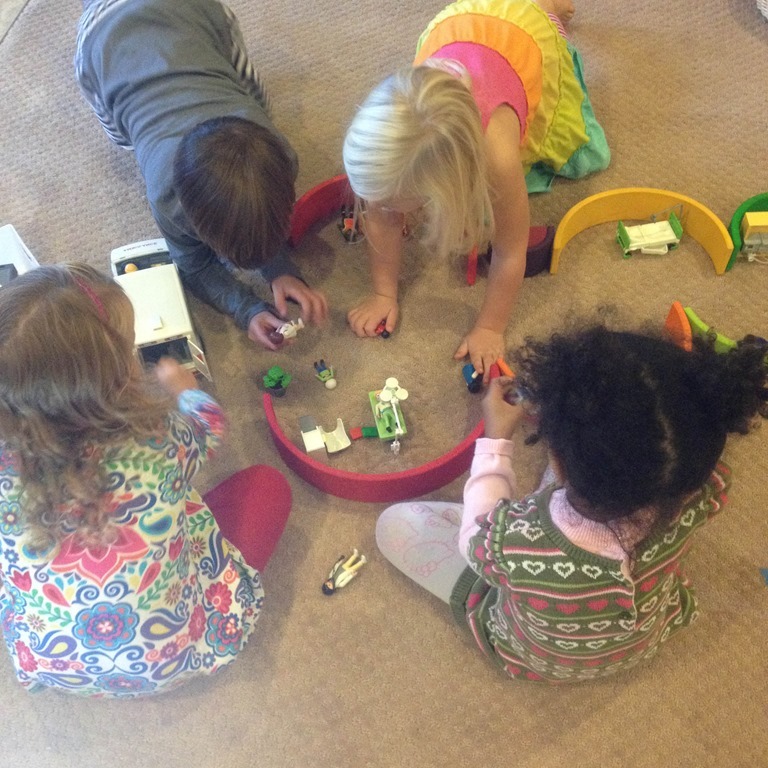 There aren’t any rules, buttons, right or wrong ways to play with loose parts. 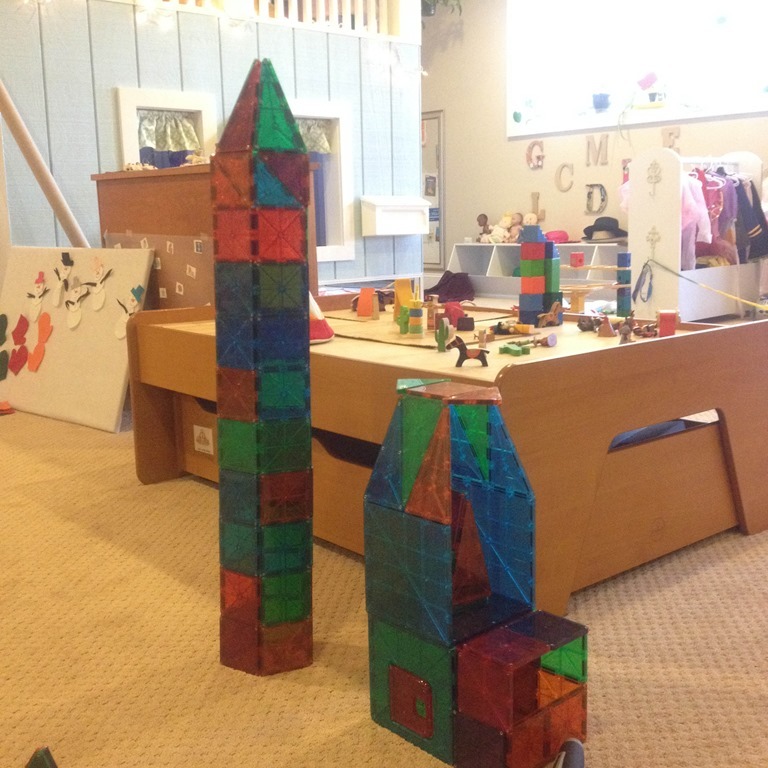 The above picture shows window blocks, unit blocks, our large hollow blocks, and Mr. Bones were all part of the creation the children were working on. 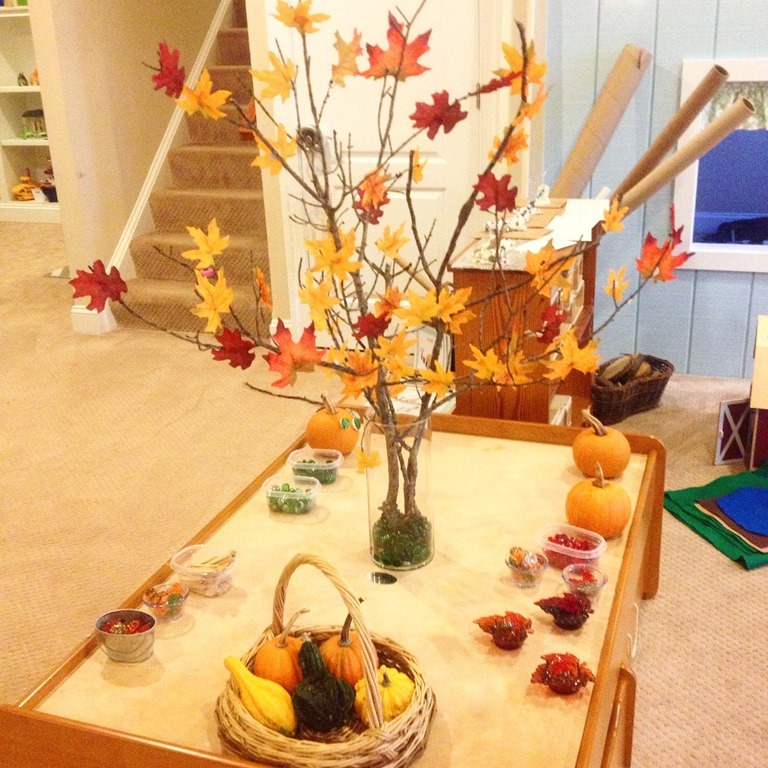 The next two photos show a sensory and loose parts area I set up this fall. 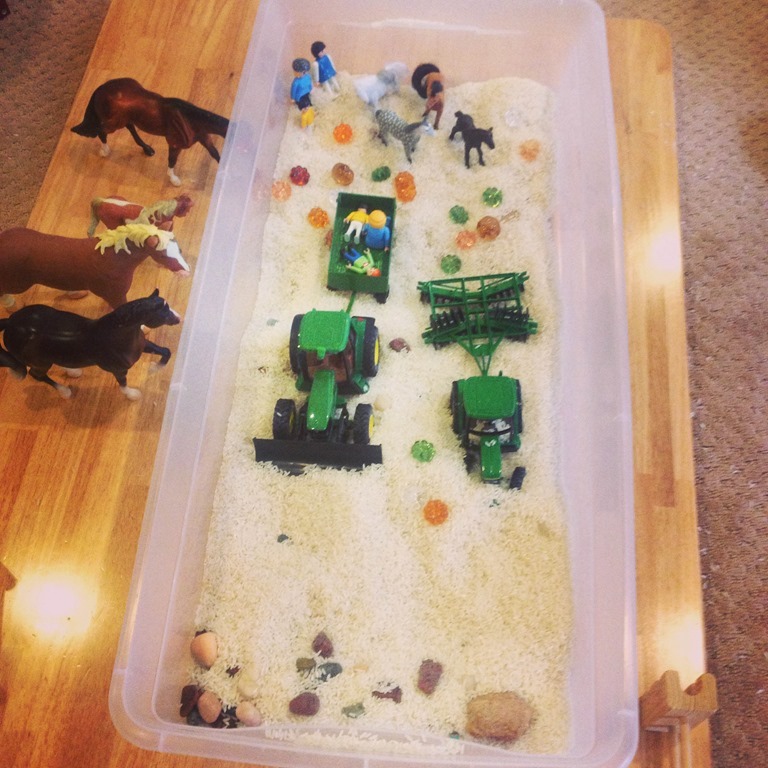 There was rice in the sensory bin, rocks, pumpkin and corn gems, lots of animals, and pieces of felt to move about. The pumpkins were dredged up, and were placed in the barn. 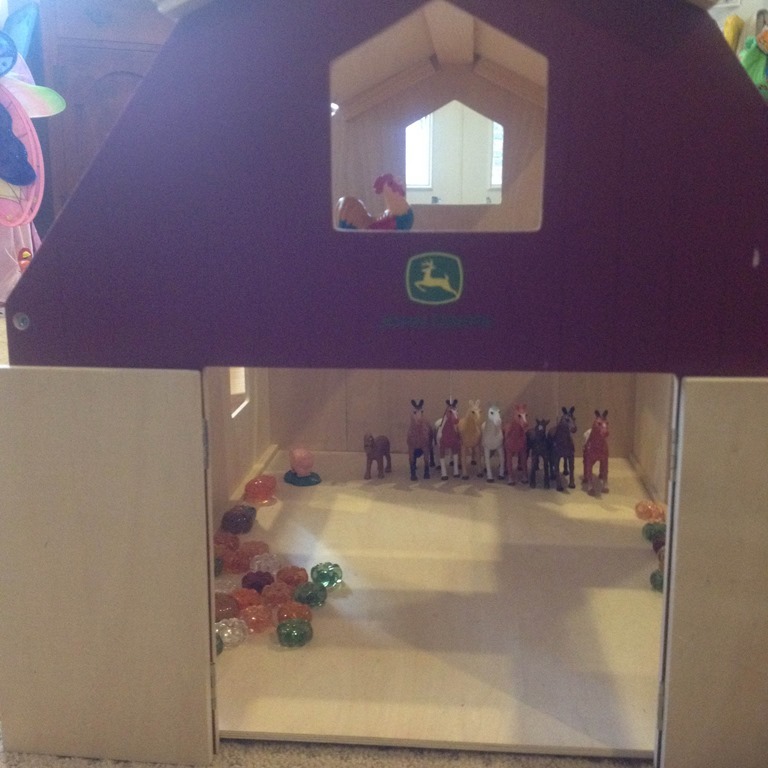 Lots of horses and animals joined up inside the barn too. The great thing about loose parts and free play in the classroom is allowing the materials to stay put. 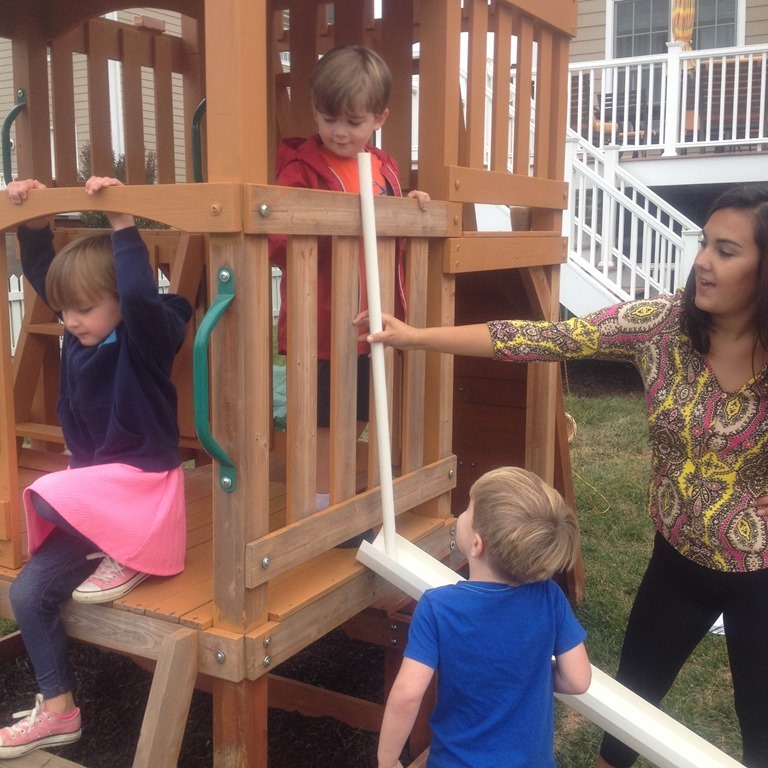 One child can start working with something and then another child can change it later or pick up where they left off! 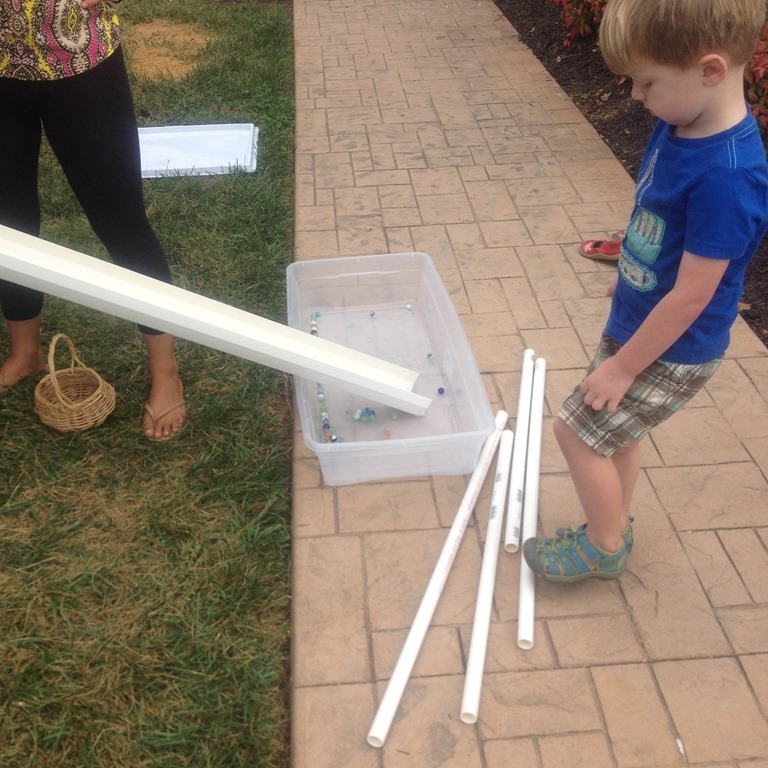 The following photos show the children’s interest in marbles and tubes. This has been an on-going interest in the group. 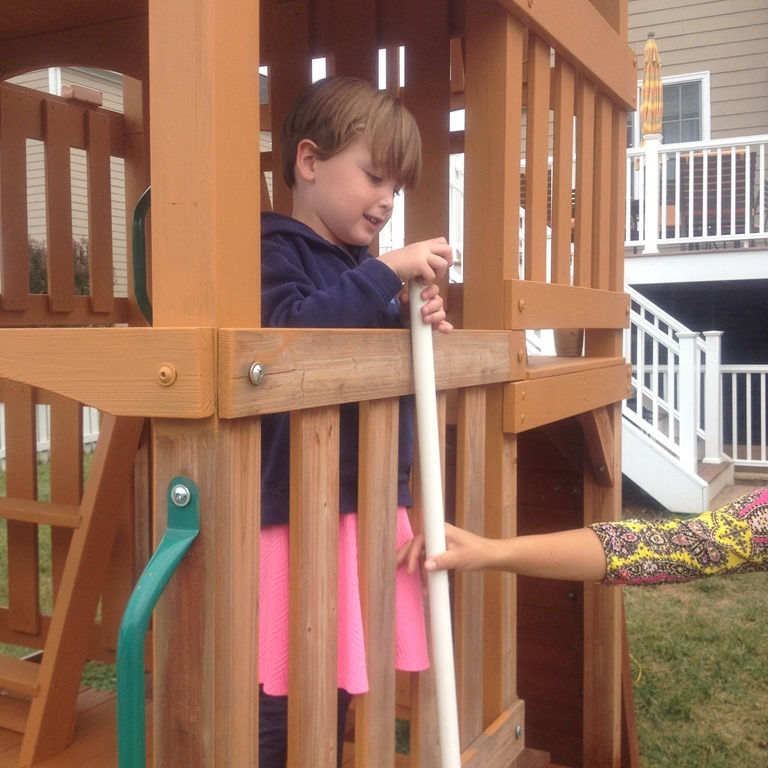 We decided to bring the tubes and gutters outside to play with them on the swing set. I set up our tree branches on the train table. 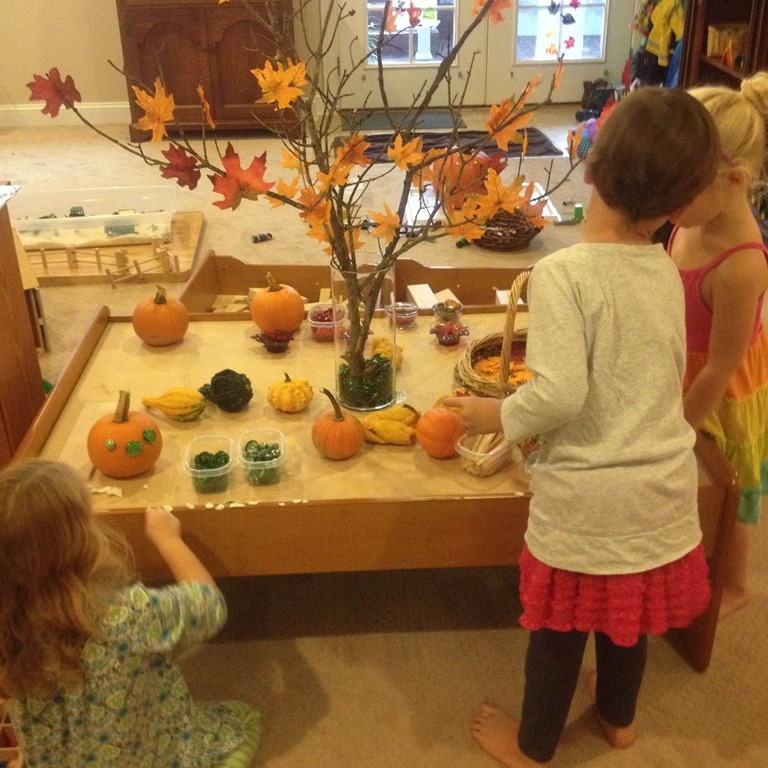 I left of a variety of materials including silk leaves, play dough, gems, wall putty, and pumpkins. The children worked with the tree on and off throughout the morning and the end product was lovely! 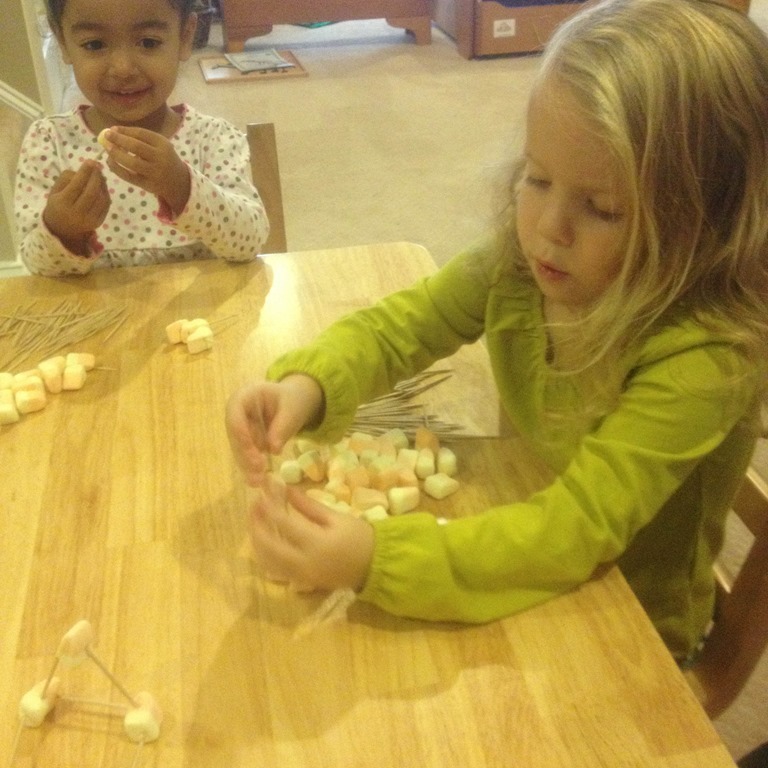 STEM building with marshmallows and toothpicks was left on the tables in October. I found really fun candy corn marshmallows at the store. 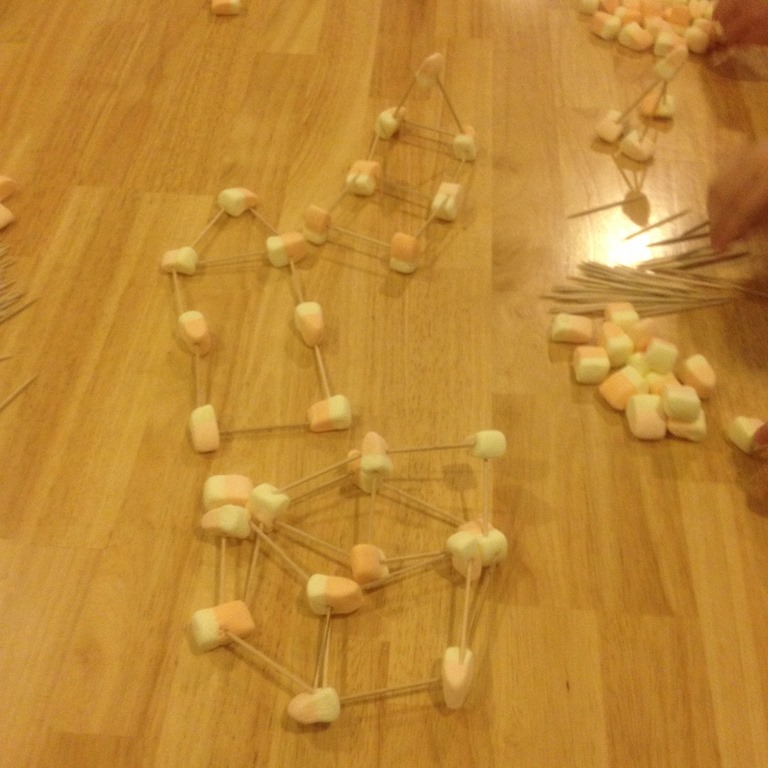 The children got busy building 2D and 3D shapes with the toothpicks. They were engaged and creative, and I was surprised by all of the different shapes and designs they made. 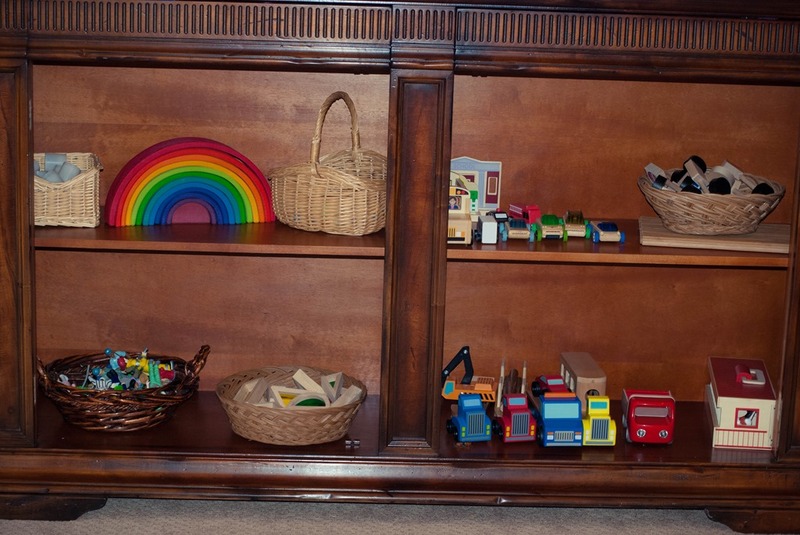 I was looking for new and interesting ways to use our wooden Rainbow set. 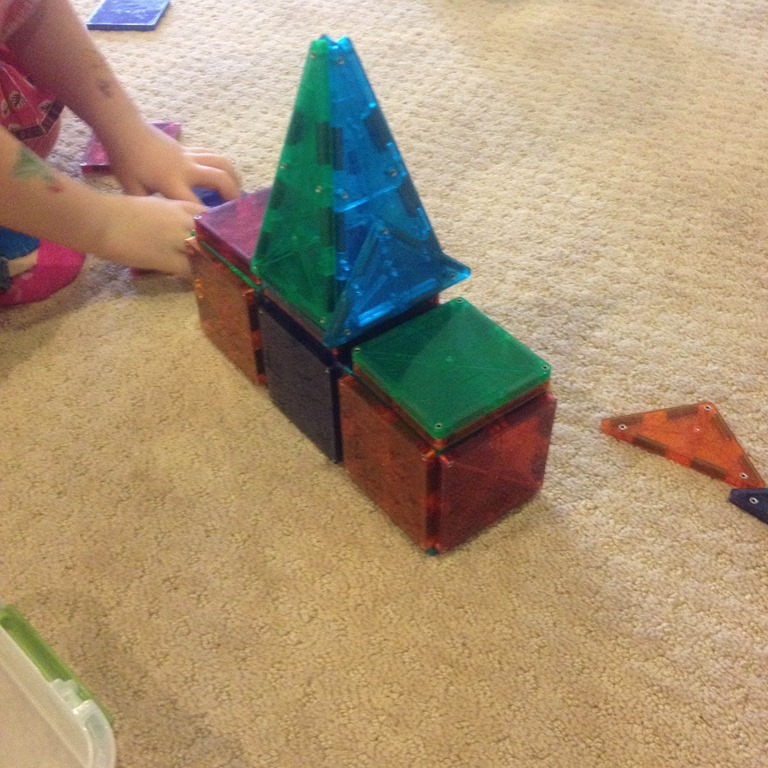 I saw the idea to lay the pieces on their side to make different rooms or areas. I set up our little hospital unit with a waiting room, operating room, doctor’s offices, and patient’s beds. 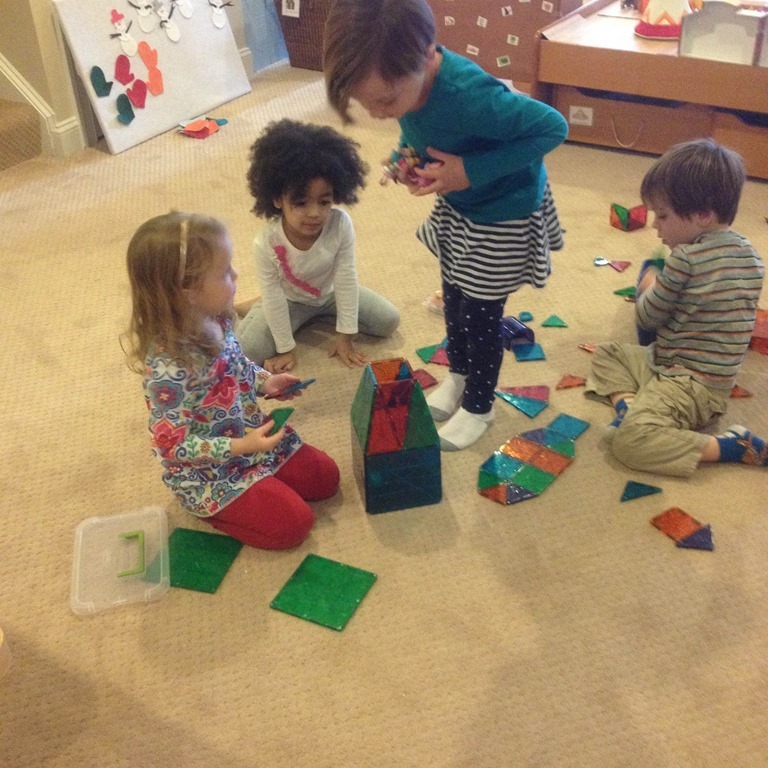 They got busy using the blocks and the Playmobil set in a new way! I hope to share more of our recent adventures soon! 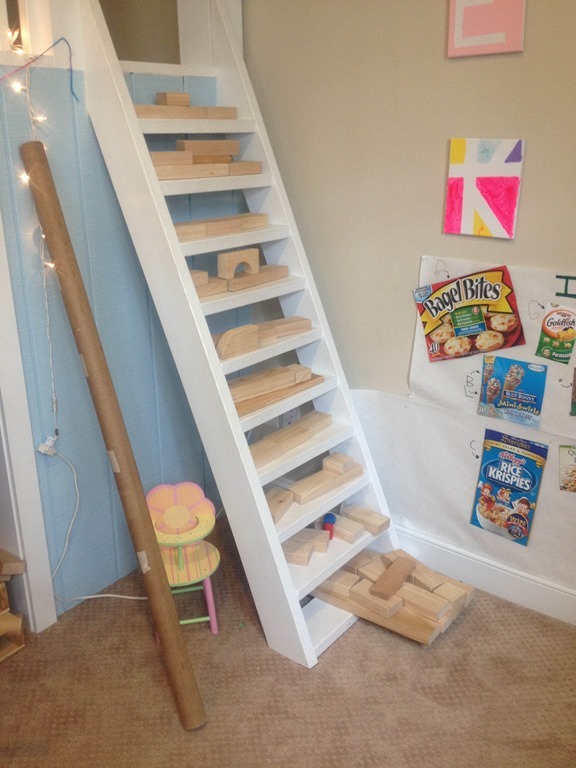 Categories: loose parts, reggio emilia inspired | Tags: learnning through play, loose parts, loose parts play, play based preschool, reggio emilia, reggio emilia inspired | Permalink.